ROSEMONT, Ill. – Chris DiDomenico notched a power-play goal at 3:34 of overtime and Jeff Glass stopped 23 pucks to earn the Rockford IceHogs two crucial points in their hunt for a playoff spot and a 2-1 win over the Chicago Wolves on Sunday at Allstate Arena. The forward gathered a loose puck at the side of the Chicago net in overtime and slipped a quick shot between the legs of Wolves netminder Oscar Dansk, netting Rockford’s first power-play tally in five tries during the contest. 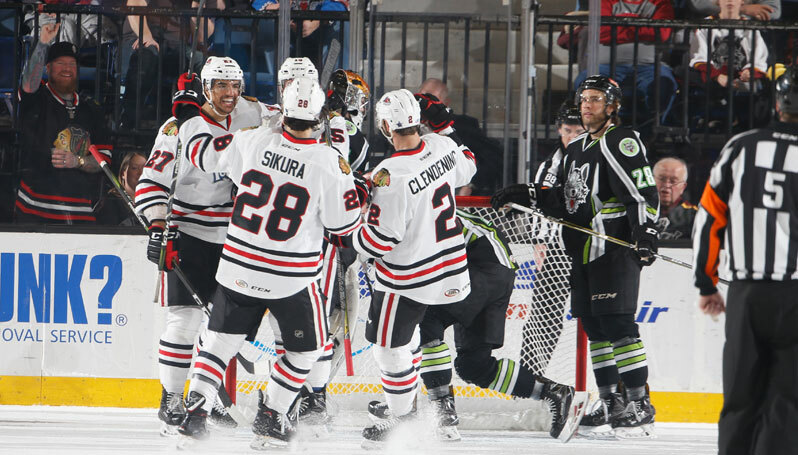 The game-winner was DiDomenico’s eighth goal of the season, and second in seven games with the IceHogs. Both teams struggled to produce offensively throughout the game, splitting a total of 10 power plays and netting just a goal apiece during the first 60 minutes. After a scoreless first period, Cody Franson got the Hogs on the board in the middle frame with a one-timed blast from the right faceoff circle that beat Dansk stick-side. Franson now has three goals and one assist across his last five games. Henrik Samuelsson appeared to double the IceHogs lead early in the final stanza, but the goal was disallowed upon review. The Wolves then levelled the affair with a power-play marker just over 12 minutes into the period, as Teemu Pulkkinen posted his 17th of the season with a deflection in front of Rockford’s Glass. Glass’ 23 saves earned his first win in four games since rejoining the IceHogs following a stint with the NHL’s Chicago Blackhawks. Dansk turned aside 37 of 39 pucks in the opposite crease, but his personal seven-game winning streak was snapped in the loss.